Movies and computer games have long used the Heads Up Display (HUD). 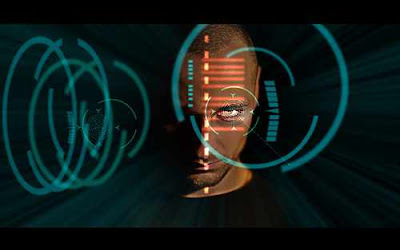 Usually in movies, these are used to depict futuristic weapon systems or devices. Movies like Terminator, Iron Man and even the old Robocop movies have shown the HUD. In computer games, those information on the screen help the player know what is going on during the game. 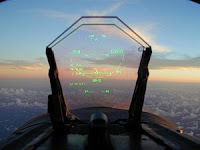 A head-up display or heads-up display (HUD) is any transparent display that presents data without requiring users to look away from their usual viewpoints. In real life applications, most would recognize the HUD from videos of jet fighters. Those are the things the pilot sees superimposed to his helmet visor or screen. They were initially developed for use in assisting pilots flying military aircraft and other military applications. Now, HUDs can be seen used in commercial aircraft, automobiles, and other applications. Researchers from the University of Washington, Seattle, and Aalto University in Finland constructed a device that could one day lead to this kind of technology without the use of heavy bulky devices. They constructed a computerized single-pixel contact lens. Babak Parviz is from the University of Washington and the lead researcher of the study. Video: An imagining of how HUD can seamlessly integrate into our daily lives. Parviz says, "Our group has expertise in miniaturization and integration of devices into unconventional substrates. The contact lens is a perfect platform for this. We also wanted to explore if it is possible to have a single personal display instead of numerous devices with numerous displays per person,"
The lens display consists of an antenna to gather power from an external source, an integrated circuit to store this energy, and a transparent sapphire chip containing a single blue LED. According to Parviz, this device does not affect the function as a normal contact lens in any way. It feels like a normal contact lens. The device could overlay computer data onto what the person is seeing, making it easy to access information instantly from platforms such as laptops, computers, and mobile phones. It could also be linked to a person's body monitor or biosensor gather information and alert the wearer to any changes in his body. At the moment, the device is in its early stages. The researchers are looking into making improvements that will allow a fully functional, remotely powered, high-resolution display on the lens. They also need to resolve the display of text characters on the display. Parviz explains, "We still need to perfect the focusing mechanism further before we can do this if the text is arbitrary. Pre-determined text is a lot easier..."
Parviz and team are not the only ones looking into this technology. Electrical Engineering students from the University of Massachusetts Amherst are also developing a Personal Head-Up Display. One such design is a HUD in skiing goggles.